I have been trying, and been disappointed by, shortbread cookie recipes for years. Jamie Oliver finally put an end to my search. His self proclaimed, Best Shortbread in the World really is the best homemade shortbread that I’ve ever made or tasted. If you’ve ever made shortbread cookies, you know that All of the recipes call for cornstarch. But I’ve discovered that the secret to shortbread cookies is to use anything but. This recipe works well with semolina or corn flour. Note that corn flour is not the same thing as cornstarch. Semolina and corn flour give the cookies a firmer, crunchier texture with a lot more flavour. For the sake of recipe testing, I tried this recipe using cornstarch and the cookies were inedible in comparison. Now that I’ve found my favourite base recipe, I can’t wait to experiment with variations like dried apricot, citrus zest, chocolate dips, etc. Note: I used an 8″ x 8″ pan by accident for the latest batch of cookies (shown above). A 9″ x 9″ pan is suggested, and I highly recommend sticking to that. Otherwise, the cookies are too thick (as shown above), take longer to bake, and turn out slightly dry on the bottom but crumbly on the top. The cookies I made using a 9″ x 9″ pan turned out beautifully. Note: I’ve used a disposable aluminum foil pan, a glass baking dish, and a non-stick metal pan. I found that the metal pan worked the best. Lightly grease and flour a 9″ x 9″ square pan. Preheat the oven to 300 F. Using a stand mixer or hand-held electric mixer, cream together the butter and sugar until fluffy and pale in colour. Gently mix in the flour and semolina or cornflour until just combined. The consistency of the dough should be soft, not sticky, and not firm enough to roll. Press the dough firmly into the baking pan. It is important that you pack the dough well or else the cookies will break apart too easily. Prick the dough all over with a fork. Bake until the top becomes lightly golden. This will take about 50 minutes (longer if you’re using a glass baking dish). Place on a wire rack (pan and all) to cool. When you remove the pan from the oven, the cookie may still give when touched. It will firm up as it cools. 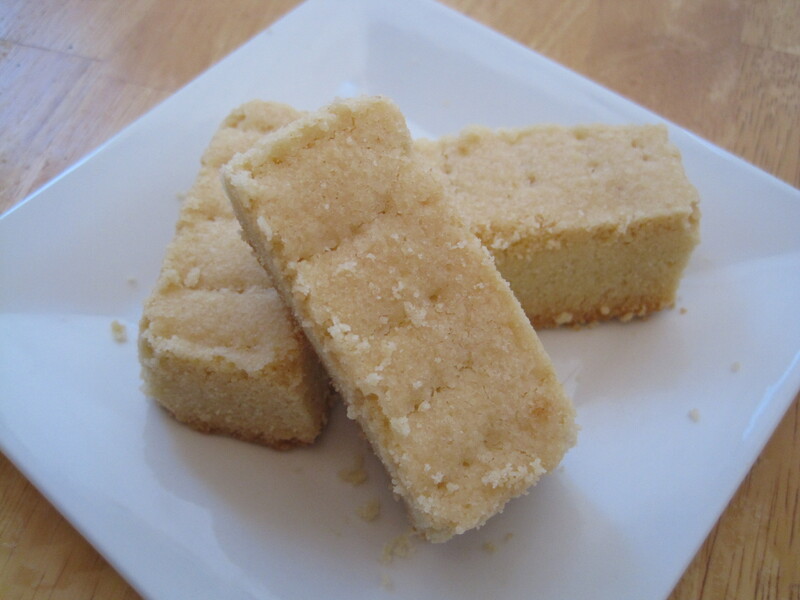 You can cut the shortbread into rectangles before it finishes cooling, but wait until they have cooled completely before serving. I’ve been wanting to try this for a very long time. I even have the book. Now that it’s the holiday season, I should attempt to make it. I definitely recommend it 🙂 Thanks for commenting! HI ALI! I made this recipe 4 times this holiday season! First, I made it exactly the way your recipe indicated. I brought it to work and got soooo popular! hehe. Then a few days ago, I made 3 more batches, one was Early Grey, Rosemary & Parmesan, and Green Tea. All are soooo good! Thanks Ali! You’re awesome! Hey Hayley! I’m so glad that everyone liked these!!! Those flavours sound Amazing! How did you incorporate the tea into the dough?